Brick masonry continues around the classroom wings. However the rainy weather conditions continue to impact schedule this week. The fine arts auditorium is taking shape now that all walls are in place and the structure and roof is in place. The line of sight from ALL seat locations in the auditorium can be experienced now as can be seen with the attached photographs. The Board of Education approved built- in seat backs for the gym bleachers on the home side. This is a nice upgrade for the fans of the activities held in the gym. A virtual reality presentation of the gymnasium area was recently experienced by the Board of Education . To the board members’ delight they were able to see the space as it will appear when completed. The parking lot addition is moving forward in preparation for the upcoming school year. A recent review of budget and schedule show the project is a little ahead of schedule and remains within budget. 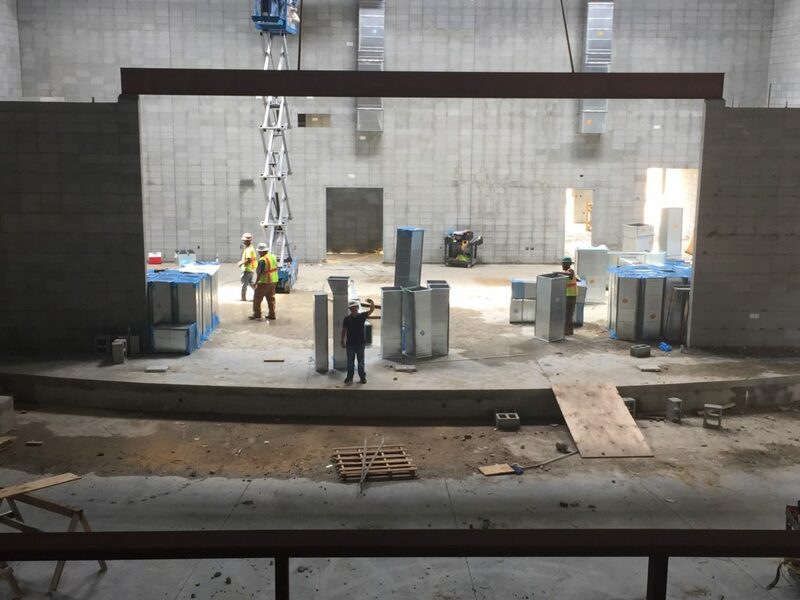 The gymnasium steel structure is in place and masonry walls are 60% complete. The roof deck is installed and the roof is scheduled within the month.